For Katerina’s oldie challenge, I pulled out an old favorite Calvin Klein LBD probably over 6 years in my closet. It is a sheath that has survived the edits because it has a side zipper rather than a back one, allowing me to get in and out of the dress more easily. I like the length and that it is an easy slim column of black. I wore it to church today with a floral bomber jacket, black sheer stockings and black ankle strap flats. Not shown, I also wore my JCrew blush stadium coat and dark blush scarf over everything. The dress now fits a bit tighter than it used to. Shall I retire it? Note: seeing the photos I did not like the bomber with it or the jewelry or black stockings with this outfit. The jacket photo shows the belt askew, which I did not notice at the time. Comments and suggestions welcome. Joyce - I have to say I loved the whole outfit!! I'm not even big on bombers but I thought you looked stunning. Love the dress on you. Very elegant. So you can't ask me, because I thought you looked amazing!! Does the dress come with the belt, Joy? I like it, and the bomber looks great over the top. Fab blush support act too. I like the dress on you, and I like the whole outfit, Joy. I think you look amazing. #3 looks fab, Joy. If you still feel comfortable in the dress, I vote keep it. Joy -- as always, you look fabulous. The dress is amazing on you. I hope it survives many purges into the future. The dress looks lovely on you and I like the way you styled it. What a great belt, too. I can only agree with others - the dress looks great and I really like the outfit. Fabulous LBD:s aren’t easy to find. So if it isn’t uncomfortable, keep it. That's an oldie after my own heart. I like it and vote keep and wear. I also like the dress on you. As long as the belt does not dig into your ribcage when you sit, I say keep. Wow,Wow, how beautiful dress, the belt is excellent , you look amazing on this dress. I love bomber jacket , looks great as a topper, high five, Joy. Keep that dress as long as you can breathe in it,and it looks great with the floral bomber,good styling! Thank you all for your kind comments. Angie, the belt did come with the dress and it has belt loops that cannot be easily removed. I had bought the exact same dress in ink ( dark navy) and wear both a lot in spring-fall. 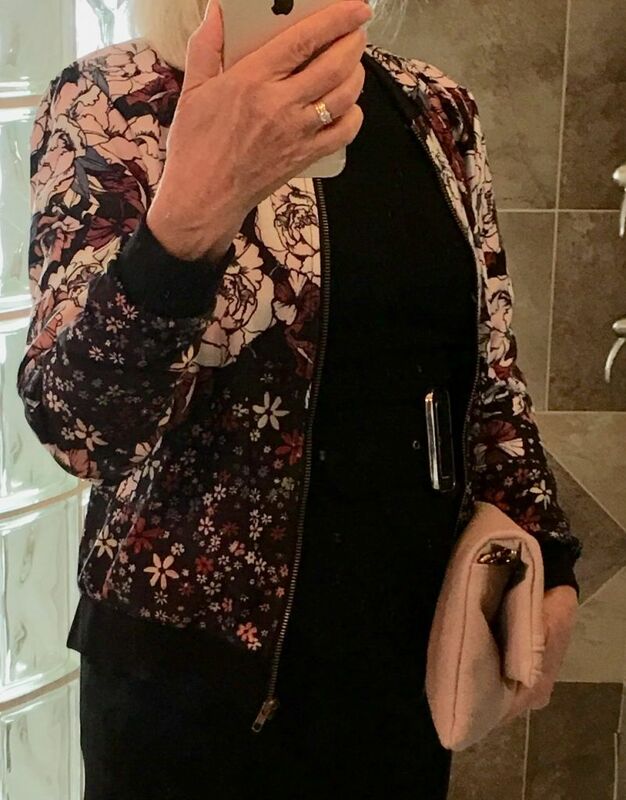 The black gets worn often with my black lace on blush bomber (another oldie which needs a Find). I think it looks fantastic- with and without jacket! Keep it! I actually like the whole outfit too! I like how the bomber adds a very current touch to a classic style. The dress seems like a keeper to me, as long as you are comfortable in it. Joyce I like it with the bomber. Where did you get that bomber? It’s beautiful. Thank you, Jussie,. The bomber is the brand Elodie. I bought it at Mordstrom Rack about a year ago as a cold spring refresher because of the floral pattern. The black background and trim make it easy to wear with a column of black. Thanks, Joy. YOU LOOK FAB. You look wonderful in this dress. I like how you have accessorized it, too. Thank you, Angie and JAileen. I am happy the oldie dress passes the YLF test.